These Point of Sale Displays Come in Red, Blue, & Black Colour Choices! Click here to see our online catalogue, with hundreds of different products to choose from in a variety of different categories that will assist in outfitting your business in style. Barrier posts, whiteboards, light boxes, lecterns, TV stands, hanging hardware, acrylic holders, exhibition stands, portable counters, & brochure racks are just some of the items we currently have for purchase. Slimline Warehouse is a national leader with a large customer base that loves our large selection of products that are made of high-quality materials and sold at low prices! Most orders placed by 1pm EST will despatch same day from our warehouse when in stock! Purchase for your business in Adelaide, Sydney, Gold Coast, Cairns, Melbourne, Brisbane, Perth, Canberra, Hobart, or anywhere else in Australia today! Retail Point of Sale Displays! These retail point of sale displays have multiple colour options available, allowing you to choose the right colour to either blend in or entirely stand out at your business! Blue, black, and red options of the plastic frame are available in order to easily fit in with any colour scheme! 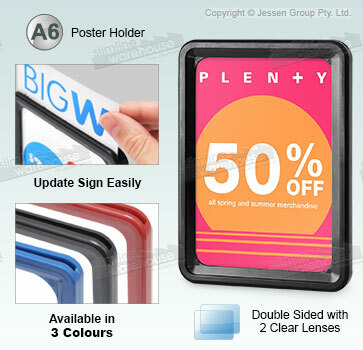 The promotion sign holders, retail point of sale displays are designed to hold an A6 (148 x 105mm) graphic in either portrait or landscape orientation. This display is great for displaying custom signs that inform of upcoming events, pricing information, ongoing sales, and much more at a variety of business types! Retail sign holders are dual-sided displays in order to reach more customers at once from a single point. This maximises exposure to your adverts without taking up more room! Retail stores, cafes, information centres, and museums are just some of the locations that commonly use this display! 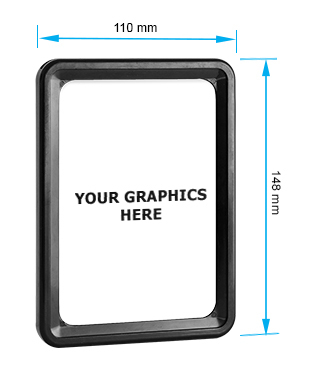 There are clear lenses included with this display that will help protect graphics from gathering grime and dust on both sides of the unit. This helps to maintain a professional appearance in any location. Switching out your posters is easy as well, as these holders feature a slide-in design that requires no tools! Order a promotion sign holder today for your business! Retail products of all colours & sizes are available now for you to choose from to help outfit your business in style. These promotion signs help to draw the attention of passersby towards your custom graphics, displaying various important information about different items or upcoming events!